At what age should one purchase (or sell) a bunny? Rabbits between the age of 6 weeks and 9 weeks are likely to make the transition to a new home quite easily. The factor that is more important than age is the method of the bunny's weaning. Was it separated from its dam yesterday? Or a week ago? Was it weaned into a cage all by itself or did it have the company of a few littermates for a while? Was it weaned from its mom AND hauled into the pet store all on the same day? If so, that would add up to some health-threatening terror! When you purchase a baby rabbit, you want to ensure that the bunny's stress levels are as low as possible. In other words, you don't want to purchase a bunny on the day it has been weaned. There is no real danger to a bunny if it is weaned at 4 or 5 weeks old. The problem arises if it gets dragged to a pet store or a new owner's home the same day it is weaned. The weaning, combined with the all-new, noisy surroundings of a pet store or new home add up to sheer terror for a baby rabbit. Terror in young bunnies sometimes turns into death by diarrhea approximately one week after a sustained spike in its anxiety level. It's okay to wean young, but if you do, then leave the kit in its familiar surroundings so it gets used to life on its own. THEN introduce the next life change, for example the trip to the pet store, after a week or 10 days. This bunny is 4 weeks old and still with its dam. It's technically weaned, but is probably too young to be thrust into a brand new environment without experiencing significant stress. If your bunny was weaned at 5-6 weeks old, you'd like to know that 5-7 days have elapsed since the rabbit's actual weaning. Even if your bunny is weaned at 7-8 weeks old, it should still be several days after the actual weaning before you take it home with you. This is so that you will know that the rabbit's stress levels are under control. Some people take comfort in the hope that if a rabbit is older than some magical age, it will never get sick. Some localities even pass laws specifying an age before which it is illegal to sell rabbits. It's well-intentioned, of course. The fact remains: some rabbits as young as the 4-week-old rabbit above have done fine going to a new home; others stress out at 11 weeks old and wake up dead one day. Like people, rabbits are individual. 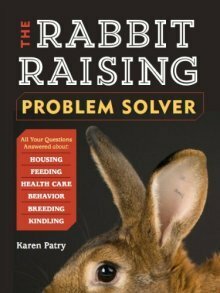 A multitude of choices factor into a baby rabbit's health. Some of those choices the rabbit breeder makes, and some of them you make after you bring your new baby rabbit home, even if your bunny is 10 weeks old when you acquire it. Unfortunately there are few guarantees when living creatures are involved. Ideally, if the process of weaning remains fairly stress-free, bunnies will do famously, even if they seem young to you. In my barn, bunnies are very close to 6 weeks old (even 7 weeks of age sometimes) by the time they have finished with our weaning process. 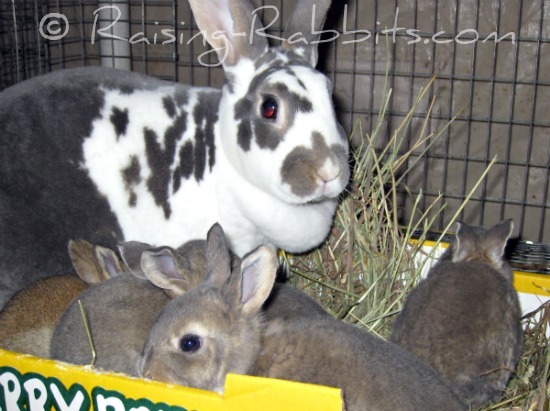 See how we do it at Weaning Rabbits. At this point, they are in minimal danger health wise should they go to a new home. Below: "Ready or not, here we come!" These rabbits are nearly 6 weeks old, big for their age, very healthy, and ready to tackle their new roles in life. Where to Get Your Bunny? 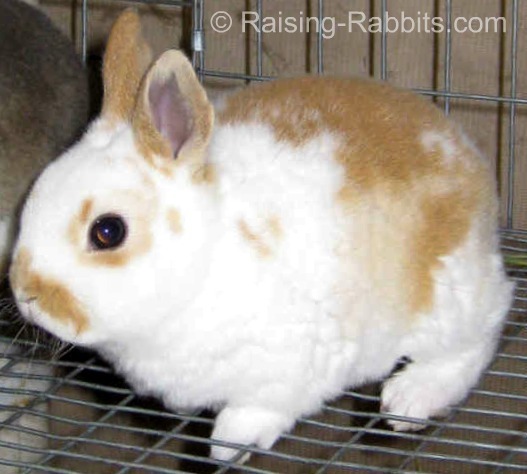 We recommend you purchase your bunnies from a serious rabbit breeder, but we have absolutely nothing against purchasing from a pet store either. We occasionally sell a bunny or two to a pet store, and if you purchased one of our rabbits from that pet store, you got a fabulous and healthy bunny. Please recognize that not all rabbits are suitable pet material. Pet rabbits should be a genuine pleasure to their owners. Talking about health, the bunny that you bring home should have a clean hind end. Flip the bunny over and ensure its bottom is either clean or that any sign of mild bunny diarrhea is well in the past. If the hind end was once soiled but is now clearly on the mend, this means that the kit’s healthy flora are already establishing themselves and it has most likely already passed any danger period. Your new bunny should also have a dry nose. Any sneezing or white gunk in the bunny’s nose means it’s sick. Don’t take it. If you hear sneezing or see white gunk in its littermates or in nearby animals, these are huge warning signs. We recommend you just walk away and get your bunny elsewhere. Arriving at its new home for the first time might feel frightening to the baby rabbit. But he should settle in just fine if you will take a few precautions at the outset of bringing the bunny home. When you get the bunny home, give it several days of quiet time, so it can get used to your home or rabbitry environment. While you're at it, keep your predator (pet) dogs and cats at a distance for at least a week or so. Once the stress of the big move has subsided, the bunny will become much more interested in socializing. The main concern with weaning and obtaining young bunnies centers on the possibility of deadly diarrhea. However now we know that the problem is not age; the most probable culprit is stress-induced dysbiosis (imbalanced gut bacteria resulting in the proliferation of clostridium and other pathogenic germs) that can kill a rabbit of any age, including adult rabbits. Give your baby rabbit plenty of grass hay every day until around age 10 weeks of age. It’s cheap health insurance. The high-fiber hay helps prevent the bad guy germs from getting out of control, which keeps your bunny healthy. At the same time, the bunny does not need any sweet treats. Let the moving stress blow over completely before you give it any apples, bananas, raisins, or similar treats. You'll find many more tips for taking care of your baby rabbit at Pet Rabbit Care, and at Pet Rabbits. Here's our Rabbit Care Checklist, which includes all the equipment you'll need for your new rabbit plus some great ideas for rabbit toys. Below: These 4 week old baby rabbits no longer "need" their dam as they can feed themselves completely, however we're in no rush to pull the doe out of the cage until the bunnies turn 7 weeks old.